Alive! Vitamin C 120 Vcaps - Nature's Way®. Vitamin C in fruit is naturally part of a total complex that includes ascorbic acid, bioflavonoids and other co-factors that aid absorption. 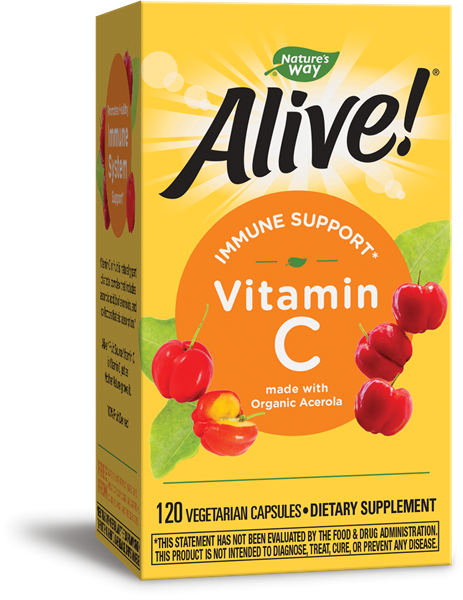 Alive!® Fruit Source Vitamin C is complete Vitamin C just as Mother Nature grows it. Unlike other supplements that use isolated ascorbic acid or cultured bacteria as the source of vitamin C, Alive! Fruit Source Vitamin C derives its entire Vitamin C content from organic acerola. Also available in organic powder form that mixes easily into water or juice. For 500 mg of Vitamin C, take 4 capsules daily. For 1,000 mg of Vitamin C, take 4 capsules twice daily. If pregnant, nursing, or taking any medications, consult a healthcare professional before use. Complete vitamin C drink mix from nature's most potent organic fruit sources.